"Thirty years have passed. I have now decided to return to Normany to find the film's transient actors." About thirty years ago, independent French director Ren� Allio made a documentary about an 1835 murder case in Normandy, Moi, Pierre Rivi�re. After hacking his family to death, Rivi�re wandered the French countryside, then allowed himself to be arrested. In prison, he wrote a lengthy, detailed, and poetic memoir about his crime. Although the judges and attorneys in Allio's film were professional actors, the rest of the cast was made up of farmers living at the location. Nicolas Philibert served as an assistant director on that picture, and this documentary details his return to Normandy to find out what had happened to these actors during the time between. There is a good deal of that material here, although for the most part it's annoyingly lacking in any sort of profundity or even clarity. Although the topic of the movie occasionally comes up, most haven't seen it since its release and their memories are dimming. Combined with this unsatisfying material are several other threads. One is a brief look at Rivi�re's actual journal, but without providing any salient details or analysis that might give the proceedings some resonance. Along with this, there are shots of Philibert looking through Allio's notes on the production of the original film; again, there's little content that makes the followup worth watching. In between, there are extensive interstitial materials that emphasize the barbarity of rural French life, as represented by the raising of pigs from messy birth to grotesque slaughter. I suppose that Philibert's point is that the brutality of modern Norman life is not all that different from that France of 1835 that sent young Rivi�re over the edge. Although the point is made quickly, Philibert insistently holds the camera on these materials, as he also does with more prosaic footage such as various cast members riding around the countryside on tractors. These extraneous matters continue to excruciating duration, quickly using up what little patience the picture has otherwise managed to earn. This is an observaton made by a viewer who's rather fond of Antonioni pictures, so you can well imagine just how full of ennui this movie is. The result is pretentious, tedious, and unforgivably self-indulgent. The epitome of the latter comes in the finale, as we're treated to a silent deleted sequence of Philibert's father as a dignitary, gesticulating ridiculously, and shorn of context or content. 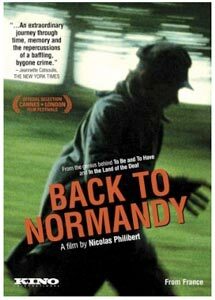 The blurb on the case of Back to Normandy makes it sound like an intriguing story, with insights into Rivi�re and his crime, or into the amateur actors, or the making of Allio's film. The blurb suggests that somewhere there is an interesting movie to be made out of this subject. This, however, is most certainly not that movie. Image Transfer Review: Although some of the landscape photography is a bit on the soft side, the visuals are for the most part quite good. The color palette is rather subdued throughout, and the black-and-white photography of I, Pierre Rivi�re comes across reasonably well, with decently preserved grain structure. A bit of edge enhancement is occasionally visible but it's not obtrusive or all that noticeable. Audio Transfer Review: The 2.0 French audio has very good stereo separation throughout, with plenty of vibrancy. That's of particular benefit to the musical score, which relies heavily on a piano either solo or as part of a small ensemble. There's fine presence and a nice wide soundstage. Extras Review: The sole extra is a ridiculously small "still gallery" with less than a dozen photos, in small size on the screen. Chaptering is rather thin. The subtitles are removable, if your French is good. Wouldn't inclusion of Allio's original film have been appropriate? Irretrievably boring, ponderous, and lacking in substance, this picture is a serious disappointment. At least the transfer is quite good, so if you have a liking for the feature, you're in luck. Don't expect much for bonus materials, though.